The primary purpose of mowing turfgrass is to improve its appearance, but there are several other benefits as well. Choosing the proper mowing technique, equipment, frequency, and height will improve and increase the health of your grass while decreasing weeds. Mow as often as needed to never remove more than 1/3rd of the leaf blade in a single mowing. Cutting more than 1/3 of the leaf blade in a single mowing is detrimental to plant health. Change patterns every other mowing so not to create ruts or permanent markings. Mowing grass at higher mowing heights ( 2 ½ “- 3” ) helps increase overall plant health and reduces weed competition. Higher mowing heights allow the plant to produce more energy and develop a deeper rooting system as well. Mowing too low will cause a rapid decline in turf health, decreased turf density, and increased weed encroachment. Sharpen your mower blades frequently. Sharply cut blades of grass increase the overall health of the lawn by improving recovery, decreasing water loss and increasing photosynthesis. Mowing grass with dull blades creates poor aesthetics, heals more slowly and has greater water loss. Returning clippings during mowing benefit the turf because grass clippings contain valuable nutrients that can be recycled into the soil. Collecting clippings will create a need for adding more Nitrogen to your lawn throughout the year. Sharpen your blades frequently. Cut at a higher height. 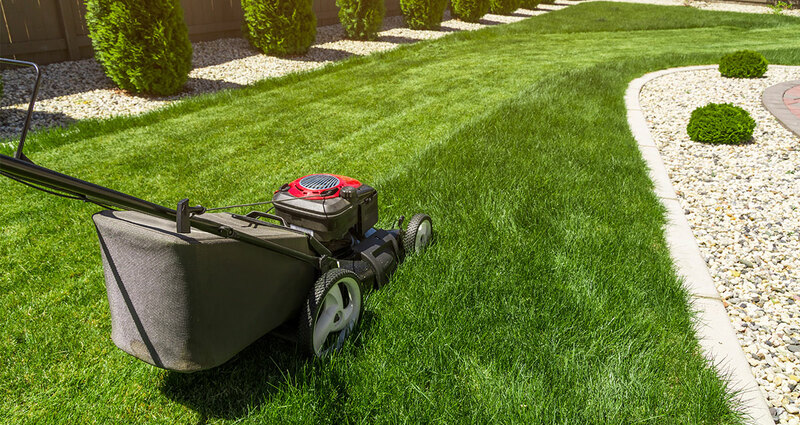 Never cut more than 1/3 of the blade of grass in any mowing session. Return clippings to the soil.